January 28, 2018 — The New York Grimpendium is my least-selling book. And that’s fine. One of them has to be. However, it’s least-selling by such an embarrassing margin from my other books, that I feel really bad for it. And keep in mind, even my better selling books are low-list author numbers. But we should talk quality, not quantity. Let’s compare it to its spooky sibling of a book, The New England Grimpendium, which came out two years before it and is doing okay [low-list author caveat] eight years later. I like The New England Grimpendium. I like it a lot. But The New York Grimpendium has 25% more sites in it. That’s about 250 to The New England Grimpendium’s 200. And that’s because I spent six more months on The New York Grimpendium. Drove thousands more miles for it. And it benefited from all the lessons I had to learn the hard way around tactic and tone during The New England Grimpendium, which was my very first book. Honestly (and don’t tell The New England Grimpendium this), The New York Grimpendium is a better book. And, yet, its sales arc dwindled fast. Why is that? Was it for some distribution or PR reason? I don’t know. I mean, it got a brief mention in The New York Times when it came out. Twice, actually. Is it me? I’d been living in New England for a couple of years when The New England Grimpendium came out. During The New York Grimpendium, I was only a sojourner in the state. But I still visited all those sites personally over the course of more than a year. And I fell in love with the state in the process. Is it because I’m the only author this millennium to have gotten the date of 9/11 wrong in the book? Let’s not talk about that. Is it content? Does New York lack the spooky creds that New England has? No way. I mean, the creepy cachet of New England is the creepy cachet of New England, but New York has its own brand of macabre. This is the land of the Headless Horseman, Rosemary’s Baby, the Son of Sam. It’s the origin site of modern spiritualism and the electric chair. It was the birth- and final resting place of Charles Addams and Rod Serling. New York is a spooky state. And I want to prove it to you. Again. 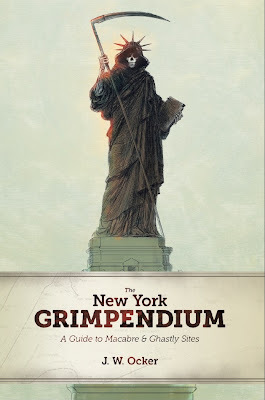 For the next six days, I’m posting examples of the sites you can find in The New York Grimpendium. That includes photos I’ve never shown (since I only had the space to include one photo per entry in the book) and some of the story of each and my experiences there, adapted right from the book. That all starts tomorrow. Today, you can grave-dig through the photo essays I posted in 2012 to tout the book’s release. Between those posts and these new ones, I’m not even scratching the surface of what lies in The New York Grimpendium. So hang with me this week, and if you find the spooky side of New York as fascinating as I do, do me a favor and pick up the book. I mean, it’s got a Grim Reaper Statue of Liberty on the cover. That should be on your shelf, right?